South Korea can ride out its latest trouble at sea. The plight of Hanjin Shipping, the world’s seventh-largest container shipper, is causing global ripples. It embodies the crisis faced by the maritime industries that helped power Korea’s extraordinarily fast development. But tough talk from state and corporate actors suggests that Hanjin can go down without taking too many others with it. Hanjin Shipping, which is weighed down by 6.1 trillion won ($5.5 billion) of debt, according to Fitch Ratings, filed for court receivership last week, after lenders led by the Korean Development Bank declined to keep it afloat. The timing is dreadful for international manufacturers, with winter holidays approaching. Freight rates have spiked as companies rush to secure alternative transport. Some Hanjin vessels have been seized or blocked from entering ports. Hanjin could end up in liquidation. South Korea’s shipping and shipbuilding industries have been struggling since the financial crisis. That hurts, given that ships made up a tenth of exports in 2011, according to the OECD. The problems have been amplified by a global trade slowdown, overcapacity, and low energy prices. The fact Hanjin Group and KDB were willing to cut Hanjin Shipping adrift suggests business and the state are both ready to take tough, economically rational decisions. Talk that peer Hyundai Merchant Marine could buy Hanjin’s “good assets” is more troublesome, though – for shippers, the most valuable assets are probably the relationships with customers, which must be in tatters here. Any spillover should be limited, too. Most loans to the maritime sector are held by policy banks that further national objectives like KDB, not commercial lenders: Fitch estimates these state institutions, which are already being shored up by the government, have extended 70 to 75 percent of loans to shippers and shipbuilders. Shipping is also relatively self-contained so it does not create much of a “multiplier” effect that boosts other sectors. Shipping ranks 79th out of 82 industries in South Korea for the extra jobs it creates for every extra billion won of demand, Nomura economists reckon. That means Hanjin can be cut adrift without causing too much pain. This article has been amended to correct the currency conversion in second paragraph to $5.5 billion, from $4.5 billion. 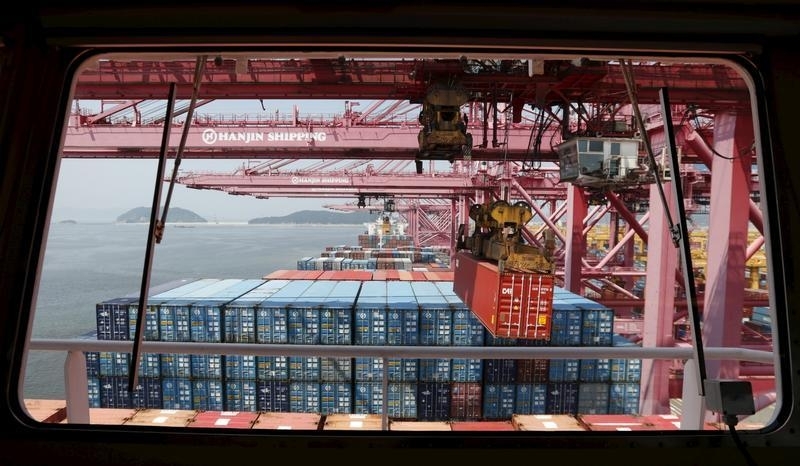 Hanjin Shipping stock swung wildly on Sept. 5, as shares in the South Korean company, the world's seventh-largest container carrier, resumed trading five days after it filed for court receivership. The filing came after Korea Development Bank and other lenders withdrew support for Hanjin Shipping. The collapse has sent freight rates soaring, and some Hanjin vessels have been seized or blocked from entering ports. By 12:30 pm in Seoul (0330 GMT) Hanjin Shipping shares stood 1.2 percent lower at 1,225 Korean won, having earlier plunged as much as 30 percent.